ALLERGEN WARNING: CONTAINS MILK (CASEIN) AND EGG. KEEP OUT OF THE REACH OF CHILDREN. DO NOT USE IF SAFETY SEAL IS DAMAGED OR MISSING. As a dietary supplement one (1) to three (3) capsules daily or as directed by a health care professional. CAUTION: Do not exceed recommend dose. Not recommended for individuals with allergies to dairy or egg products and should not be used by pregnant or nursing mothers or children under 18 years of age without the advice of a physician. 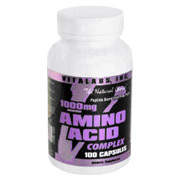 This product is intended to supplement the diet with additional protein and should not be used as a meal replacement. Not for use as part of a weight loss program without the direct supervision of a health care professional. Excessive protein intake may result in impaired kidney function.